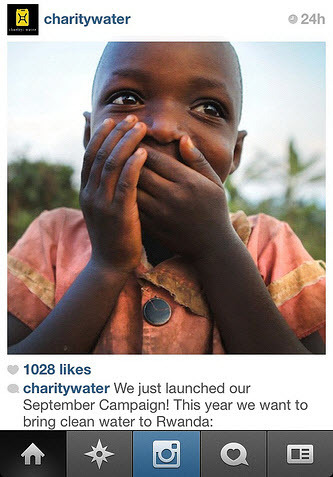 Is Instagram useful for nonprofit marketing? Target audience: Nonprofits, cause organizations, foundations, NGOs, social enterprises, Instagram users. Smartphone use has become pervasive, citing recent research reports from Pew Internet for America Life research. You know that your nonprofit or social enterprise can use Google Analytics to measure traffic not just from referring websites but from social networks like Twitter, Facebook and Google Plus, right? • By clicking on Traffic sources > Referrals in Google Analytics, you can see the number of visits you’re getting via Facebook, Twitter, Google Plus, etc. • You can set up Advanced Segments to determine in-bound traffic from multiple sources and combine them into buckets that make sense, like Twitter.com, t.co (Twitter’s url shortener), HootSuite and bit.ly, or from Facebook and Facebook mobile. You can then see how traffic from Facebook and traffic from Twitter compare. • You can use the same trick with any landing page on your site, giving you a better sense of who’s coming to that page via social media sources. Which Facebook Insights metrics matter to your nonprofit? Target audience: Nonprofits, foundations, NGOs, cause organizations, businesses, brands, social media managers, Web publishers, individuals. Now that Facebook has rolled out the new Insights to all Pages, you’re probably wondering what some of these new metrics mean. But you’re also wondering which ones really matter. Yes, you can still view how many fans you have, and you can even see how many collective friends your fans have! But these numbers really don’t matter if no one cares about your organization. 1. No one’s seeing any of your Page stories. 2. No one’s talking about your organization. Target audience: Nonprofits, NGOs, cause organizations, social enterprises, brands, social media managers, individuals. Two weeks ago, Facebook launched a completely new version of Facebook Page Insights along with several new metrics. People Talking About This – This is the number of people who engage with your Page and includes users who have liked your Page, commented on or shared a post from your Page, answered a Question you’ve asked on your Page, or tagged your Page in an update or in a photo. This also includes Facebook users who’ve responded to an event on your Page. Friends of Fans – This is the total number of friends all your fans have. Reach – The number of people who have seen content associated with your Page. You can access your Facebook Page Insights directly under your Facebook Page’s main image in the sidebar (FYI – this tab can only be viewed by Page admins). The first tab you’ll see when you click on Insights is an overview of your Page. This tab shows you the day-to-day information you need to know as a page administrator. What do those four numbers at the top mean? Total Likes – Total likes is simply the number of people who have liked your Facebook Page up until yesterday. Friends of Fans – Friends of fans is the total number of friends that all of your Facebook fans have, taking mutual friends into account. This number is more useful if you are running a Facebook Sponsored Like Story because it would be the total number of people who could see that ad. The percent increase or decrease next to this number is a comparison with the previous seven-day period. People Talking About This – This is the number of people who engaged with your Page over the past seven days and includes users who liked your Page, commented on or shared a post from your Page, answered a Question you’ve asked on your Page, or tagged your Page in an update or in a photo. This also includes Facebook users who’ve responded to an event on your Page. The percent increase or decrease next to this number is a comparison with the previous seven-day period. Weekly Total Reach – This is the number of people who have seen any content associated with your Page (including any Ads or Sponsored Stories pointing to your Page) over the past seven days. The percent increase or decrease next to this number is a comparison with the previous seven-day period. Last week public relations and measurement professionals met in Lisbon, Portugal, for a summit hosted by the International Association for Measurement and Evaluation of Communications. Of interest was an workshop that was designed to begin setting the standards in social media measurement co-facilitated by KD Paine, an expert in communications and social media measurement. The workshop shared a landscape analysis of what’s already out there from the various industries to build a clear understanding of what’s in place and what isn’t in terms of valid metrics around social media measurement. Download the 18-page document (PDF) here. The workshop built on the Barcelona Declaration of Measurement Principles (PDF) that were identified at last year’s summit. These are more philosophical but represent good practice for a measurement approach to accompany your social media strategy. 1Set SMART objectives and identify a measurement strategy at the start of your campaign or program. 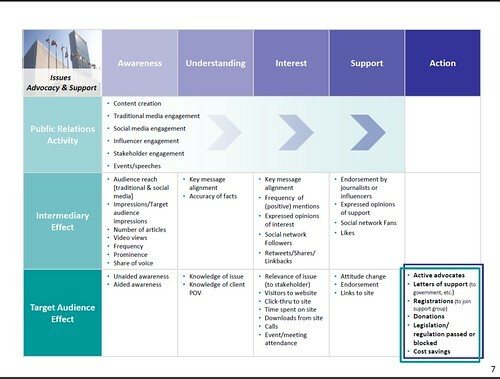 Social media measurement should take a holistic approach including both traditional and social media and look at changes in awareness among key audiences, attitude, action and behavior change that impacts business results. See accompanying article published on Socialmedia.biz today: 10 ways to measure social media for business. Your organization or business knows that it’s important to measure the progress you’re making with your social media program or campaign, as we discussed in Getting started with social media metrics. But what do you measure, why and how? First off, don’t obsess about metrics. In fact, forget about the data altogether. What you’re really trying to do is advance your organization’s mission. Metrics are just a tool to help you do that. All of these goals can — and should — be measured. And you’ll notice that while social media will be used to pursue and measure your progress in achieving many of these goals, others don’t involve social media at all. That’s OK. Social media should fold into your overall metrics program, not the other way around. 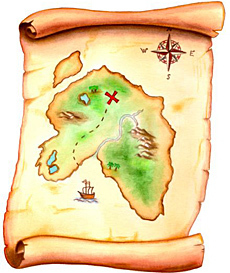 Now that you have a list of goals, you’ll want to map them to Key Performance Indicators, or KPIs. A KPI is simply a metric that you track to assess whether you are accomplishing your business goals. There are literally hundreds of KPIs that you could be tracking in a spreadsheet, but your team will want to identify only a handful that matter most — the ones that will specifically help you achieve your goals. For instance, if you want to grow your list of supporters, you’ll be able to measure the number of newsletter or RSS subscribers. If you want more interactivity on your blog, you can measure the average number of comments that people post. There are dozens more, but you get the idea. Some of these social interactions may map to multiple goals. Last year the the Interactive Advertising Bureau released a document detailing social media metrics and definitions.